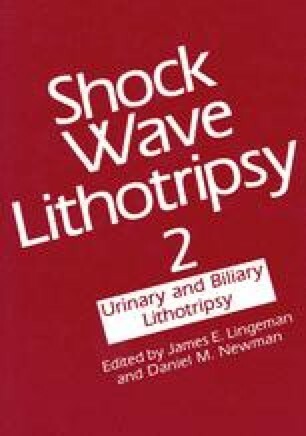 Extracorporeal shock wave lithotripsy (ESWL*) is successful in fragmenting 85% to 90% of kidney stones. Application of this technology to gallbladder stones was studied in 37 adult female swine. Twenty-two swine underwent cholecystostomy with implantation of human gallstones. After a ten-day recovery period, 20 animals received ESWL with the Northgate SD3 lithotripter. Each animal was given 2,000 shock waves, a number determined in preliminary water bath studies to be effective, and the energy level was equivalent to the 18 kV to 20 kV recommended for the Dornier HM3. In ten of these implanted swine; frequent focal point (F2) refocusing and biplanar ultrasonography were employed. Two animals served as operative controls. All animals were sacrificed after one to four days. Fifteen additional swine without gallstone implantations were studied for adverse effects of ESWL on tissue. The nonimplanted swine received 5,000 shock waves; seven animals were sacrificed one to four days after treatment, and the rest were sacrificed after four weeks. Biochemical tests (total bilirubin, alkaline phosphatase, lipase, amylase, serum glutamic-pyruvic transaminase, and lactic dehydrogenase) were obtained in all animals at entry into the study and every second or third day until sacrificed. If success was defined as all residual gallstone fragments smaller than 9 mm in diameter, success was achieved in 17 of 20 animals overall. A second definition of successful fragmentation was also used: all residual gallstone fragments 4 mm or smaller in diameter. Success according to the 4 mm definition was achieved in 14 of 20 animals overall but in all ten animals in which the refocusing of F2 had been employed. In all animals, slight perivascular hemorrhage and minimal coagulation necrosis were seen histologically only in that portion of the liver parenchyma adjacent to the gallbladder bed. The remainder of the liver was grossly and histologically normal. No injuries to the colon, duodenum, common duct or pancreas were observed grossly or microscopically. No alterations suggesting injury or altered function occurred in any of the biochemical tests. Therefore, it is concluded that ESWL may be safely and effectively applied to treatment of gallbladder stones.